Visit North-Korea and describe it afterwards, how can you do that? I think it's how Jodie Foster in the film Contact felt. How do you describe the fact you've encountered an alien? Few experiences are so out of this world than visiting North-Korea during a JSA and DMZ tour. And nothing can really prepare you for it. Ironically DMZ stands for the demilitarized zone at the border. Ironic, because there sure is lot of militair personnel running around. 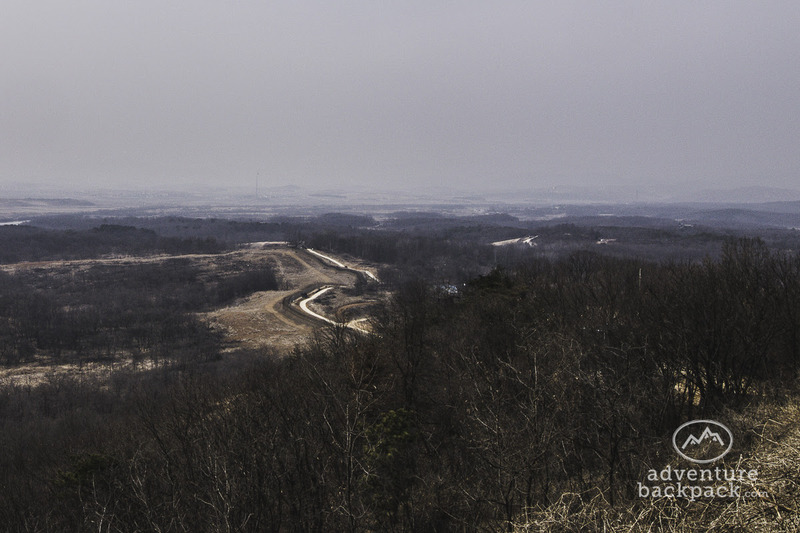 The DMZ forms the 2 km wide area on both sides of the border and is neutral territory. The territory is marked with about 1292 markings. You can only enter this zone by booking a tour, the DMZ tour. In the DMZ you'll find the JSA, short for Joint Security Area. Or in other words: this is where you can visit North-Korea. 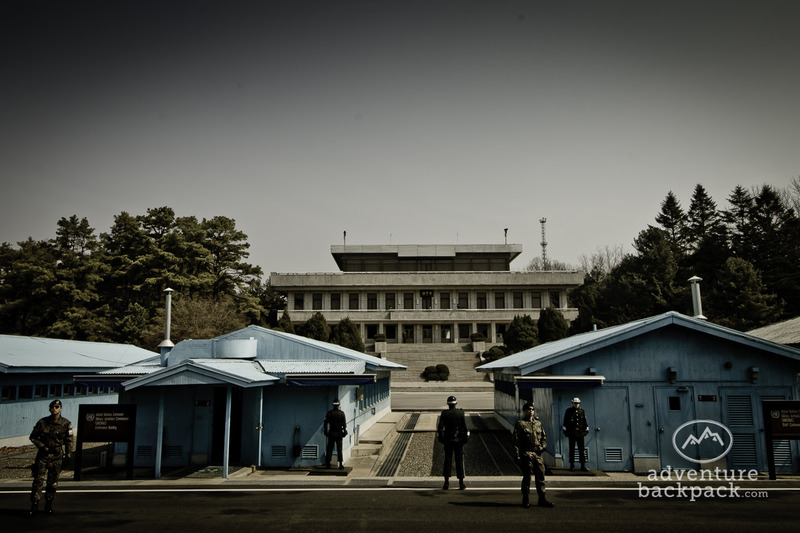 Panmunjom Travel Agency provides professional day and half day tours to the DMZ and/or JSA. Guides speak very well English. They even provide a tour with a defector, so you can interview a North-Korean first hand! Visiting North-Korea leaves an impression on you. The tour bus will pass mine fields with still about 2.000.000 land mines. (In this field lays the most deadly golf course in the world; holding only one hole.) In the JSA you'll sign an agreement wherein you agree that the U.N. is not responsable for your death on the terrain. In the tour bus a U.S. soldier will guide you and he'll carry a loaded gun. The tension hangs in the air. Especially when you enter THE container. This container, the only place where North- and South-Korea talk, on their own ground. In this container you will take the step from the safe South, to the strict and closed North-Korea. The same container wherein North-Korean soldiers work at the same time that your in there. One wrong look or gesture towards the soldiers could initiate another (world) war. Dorasan station; the first train station at the border, sponsored by North-Korean refugees. A South-Korean brand new and ready to go station, including gates for customs. Never before did you behold such an empty departures/arrivals hall in an international train station. You can buy a symbolic ticket to the next station in North-Korea. 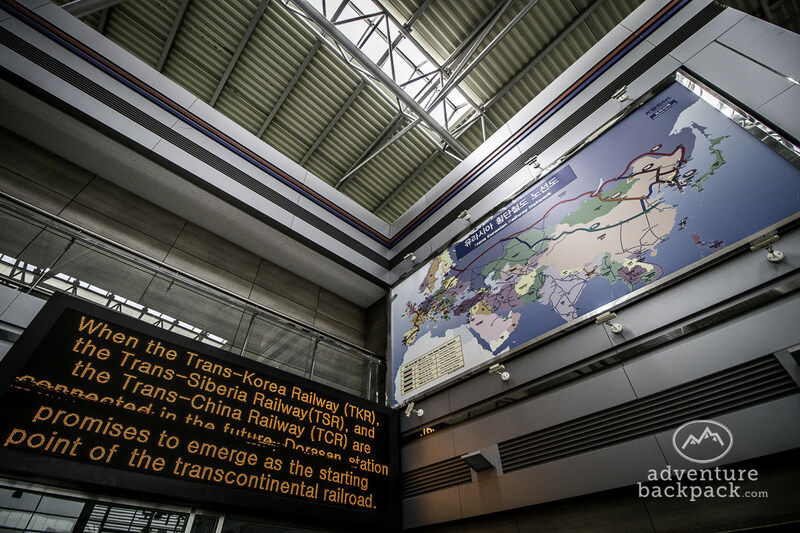 This station is proof that South-Korea is ready for unification. From Dora Observatory you check out what is going on behind the border. With binoculars you see the propaganda village: Kijong-Dong. A village especially built to lure South-Koreans to the North. Don't forget to check the two flags of the Koreans: on the left the bigger one from North-Korea and on the right the smaller one from South-Korea. Because North-Korea is so ''mature" that they have to have the biggest in everything. (This flag hangs with 270 kg on the fourth biggest flag pole of the world with 160 meter height.) From Kijong-Dong in the North you hear 24 hours per day loud, North-Korean music and propaganda talk. South-Korea responds with an even louder sound system. Private Walter, the U.N. soldier who guides us, let us know he sometimes lies awake because the speakers are so loud. Furthermore he points out that the doors and windows on the houses are painted on. Activity in the village is non-existent. Take a helmet and walk to a depth of 265 meter into the third infiltration tunnel. The tunnel was dug by North-Korea. The peace talks in the seventies were stopped when South-Korea found out they were digging tunnels towards Seoul. Four tunnels have been found. North-Korea was planning a surprise attack on the biggest city of South-Korea. Thanks to a North-Korean defector, South-Korea found out about the existence of the tunnels. By putting tubes filled with water into the ground, the tunnels were discovered. One of the tubes exploded because the North-Koreans used dynamite to dig the tunnels. The enthusiastic guide jokes behind you"Don't run to the North!" 60 years, that's a long time. Fled Koreans or those chosen to live in the South (when that was possible on the Bridge of No Return) looked for loved ones at the border. Everywhere you could see notes, pictures of missing family members or friends. Nowadays Paju is a touristic place. The search is over for a lot of people: time passed and the oldest generation is almost gone. The memorial monument is there now as a symbol. 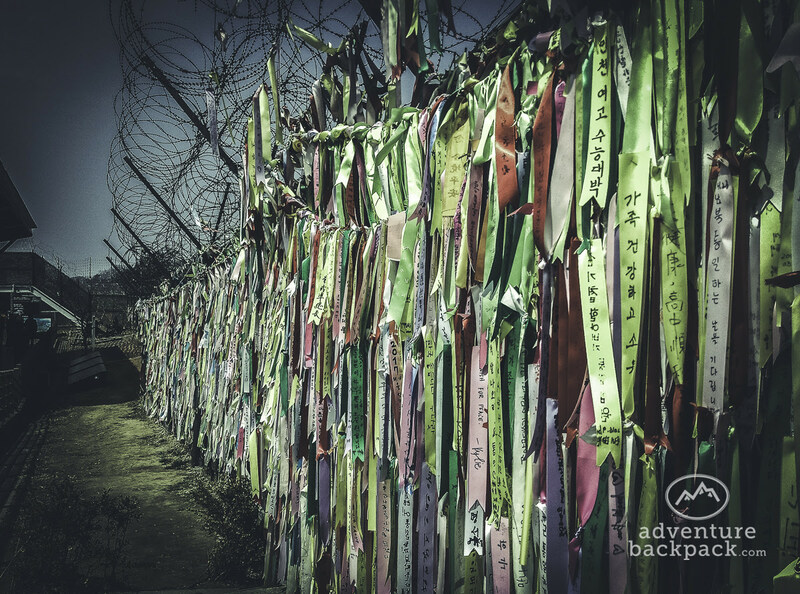 Just like the many colorful ribbons with dreams of peace for the two Korea's. There's an easy link to be made with Berlin. Would the Korea's ever be one? This trip makes your knees shake and runs shivers down your spine. It's so controversial and weird that you can visit these places with a tourist bus, it teaches you a lot about the war and war in general. But also about freedom. The freedom where we can be so proud of. Original text in Dutch here.